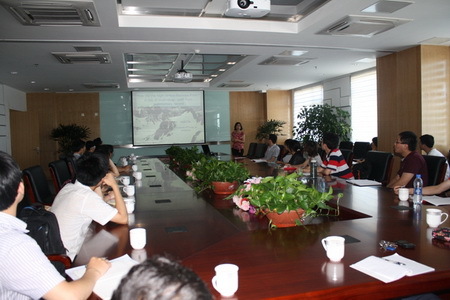 Dr. Majie Fan of the Department of Earth and Environment Sciences at the University of Texas at Arlington was invited by ITP Prof. YAN Maodu to visit ITP on July 2, 2013. She presented her research during this visit entitled ‘How did the high central Rockies form? A tale of multi-stage uplift from sedimentary record.’ She introduced the tectonic evolution history of the Rockies by reviewing recent research progresses in this aspect and existing problems. She also elaborated on sedimentology and stable isotopes in chronology, the approaches she and her colleagues applied in an attempt to study the stratum of the Rockies, erosion-uplift rate, and paleo-elevation history.